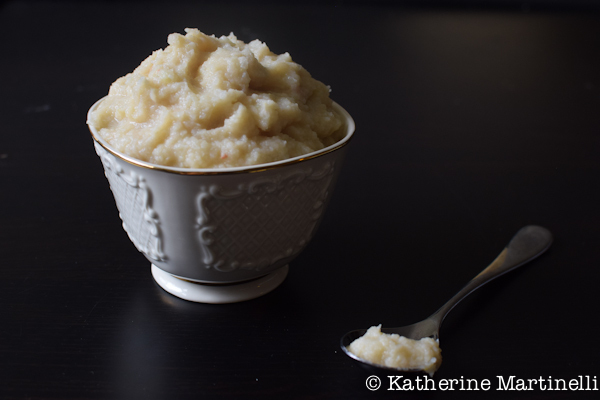 Mashed potatoes have always been one of my favorite foods. They are the ultimate comfort – creamy, hearty, warming. But, also, carb heavy, which not everyone is into. We’re not big on diets, but when we feel our pants getting tight we try to eat in a slightly more “slow carb” fashion which is, thankfully, very bean-friendly. And so the white bean obsession continues. This recipe is super easy, immensely healthy, and hits the spot when you’re craving mashed potatoes but want a little more nutrition than they offer. This vegetarian recipe for cauliflower and white bean mash can easily be made vegan, and uses only a few ingredients. Put the broth in a medium to large pot and bring to a boil. Add the cauliflower and cook until tender, about 10 minutes. Mash together the cauliflower, white beans, and cheese (if using). Add ½ cup of the reserved broth and the salt and blend with an immersion blender until smooth. Add more broth if necessary to loosen it up more. Taste and add more salt if you like. I really like the combo of white beans and cauliflower. I usually combine them in a gratin or something similar. Which, now that I think about it, is basically take a mash an additional step or two. I should try this — easier and much less caloric than a gratin! Good stuff — thanks.